How do we manage resources that seem to belong to everyone? Natural food reserves, energy resources like fossil fuels, a clean environment, with clean air, water and soil belong to everyone and yet are protected by no one. Today, protecting such common-pool resources has become a challenge, not only on the local scale but on national and global ones as well. In the 1960s, ecologist Garrett Hardin invoked the analogy of a “commons” in support of his thesis that as human populations increased, there would be increasing pressure on finite resources at both the local and particularly the global levels, with the inevitable result of overexploitation and ruin. 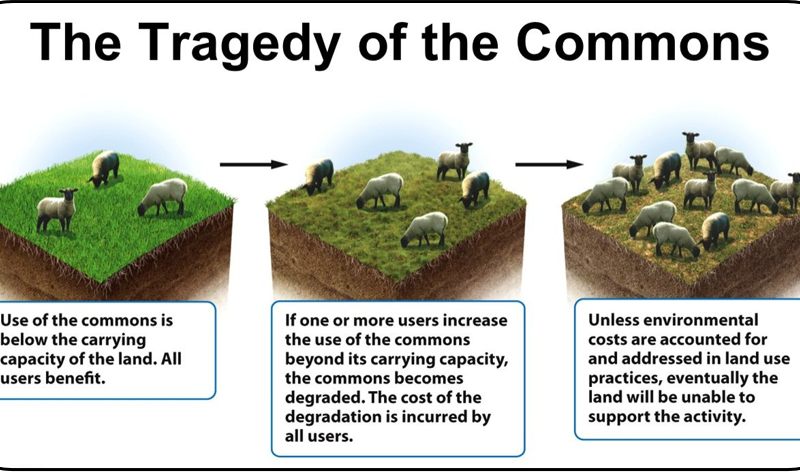 He termed this phenomenon the “tragedy of the commons.” More specifically, this phrase means that an increase in human population creates an increased strain on limited resources, which jeopardizes sustainability. The negative component is a function of the additional overgrazing created by one more animal. Since, however, the effects of overgrazing are shared by all the herdsmen, the negative utility for any particular decision making herdsman is only a fraction of – 1. Adding together the component partial utilities, the rational herdsman concludes that the only sensible course for him to pursue is to add another animal to his herd. And another…. But this is the conclusion reached by each and every rational herdsman sharing a commons. Therein is the tragedy. Each man is locked into a system that compels him to increase his herd without limit – in a world that is limited. Freedom in a commons brings ruin to all. In a reverse way, the tragedy of the commons reappears in problems of pollution. Here it is not a question of taking something out of the commons, but of putting something in – sewage, or chemical, radioactive, and heat wastes into water; noxious and dangerous fumes into the air. The calculations of utility are much the same as before. The rational man finds that his share of the cost of the wastes he discharges into the commons is less than the cost of purifying his wastes before releasing them. Since this is true for everyone, we are locked into a system of “fouling our own nest,” so long as we behave only as independent, rational, free enterprisers. The tragedy of the commons as a food basket may partially be averted by private property, or something formally like it. But the air and waters surrounding us cannot readily be fenced, and so the tragedy of the commons as a cesspool must be prevented by different means, by coercive laws or taxing devices that make it cheaper for the polluter to treat his pollutants than to discharge them untreated. Unfortunately, the owner of a factory on the bank of a stream – whose property extends to the middle of the stream – often has difficulty seeing why it is not his natural right to muddy the waters flowing past his door. The law, always behind the times, requires elaborate stitching and fitting to adapt it to this newly perceived aspect of the commons. The pollution problem is a consequence of population. As population has become denser, the natural chemical and biological recycling processes have become overloaded, calling for a redefinition of property rights.